You know, there are many things I have learned in life that would be useful to have kept around in my brain, but that immediately flew away. And yet somehow I have still allotted valuable brain space to knowing this jingle. "Almond Joy's got nuts, Mounds don't!" And I'll also never forget that guy's deep voice intoning "Beeee...cause!" Remember this jingle? I also remember being shocked that I liked coconut in candy, because in every "Peanuts" strip ever the kids never wanted to get a coconut chocolate and always did. Charle Schulz must have hated the stuff. I think the most interesting thing about that ad was the old font on the wrappers. I didn't know that I missed that more formal font until just now. Radio and TV jingles are insidious in the way they take up residence in our memories, never to leave. I remember hearing about a study done on dementia patients who could no longer recognize their own family members, and yet could recall jingles and theme songs from decades before. I'm often frightened by how well I remember the jingles blogged about here... and I often have trouble remembering what I ate for breakfast this morning!! 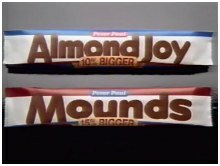 BTW, I never paid much attention to Mounds or Almond Joy, because I hate both coconut and almonds! Music Week: 1988 -- "Simply Irresistible"
Music Week: 1984 -- "Somebody's Watching Me"
Music Week: 1982/83 -- "Pass the Dutchie"
Music Week: 1971 -- "Gypsies, Tramps and Thieves"
Classic Clip Monday: Jean Nate, Jean Nate! "It's called New Wave Rock"